Wanchese office intern and North Carolina State Unversity student, Kadie Midgett, has spent her past two summers working at the federation’s Northeast office. This summer she has worked to develop new applications for the federation’s monitoring efforts. Kadie has spent 240 hours, funded by the Golden LEAF Scholars Leadership Program, completing two Android apps for both staff and volunteers to use. One of the two apps focuses on living shoreline monitoring. Previously, observations were handwritten at the project locations and then manually entered into spreadsheets for further evaluation. This app increases efficiency by enabling the user to record numerical and qualitative data about the site vegetation and then uploads the information for correlation analysis. Kadie also created a water quality monitoring app for staff and educational use at the new Northeast office dock. 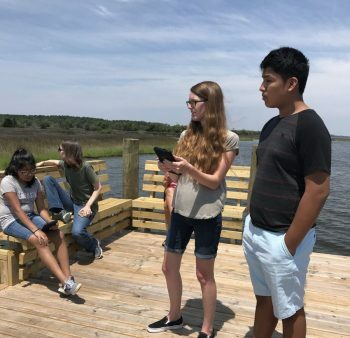 The water quality monitoring app allows the user to enter data observed from a multi-probe device and a king tide measuring stick attached to the dock. “King tide” is a term used to describe water tides when they are at their highest. Both apps were created using the Cybertracker app development program. 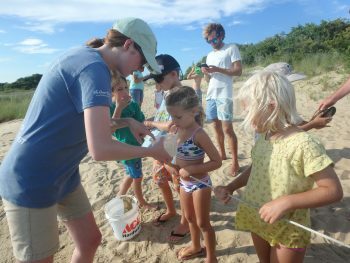 Sara Hallas, coastal education coordinator in the Wanchese office, has previously used the Cybertracker development program to create an app for the Lost Fishing Gear Recovery Project. In addition to creating these apps, Kadie assisted with numerous education and outreach events including the Sea Change Partnership group and the Green Teens summer camp. 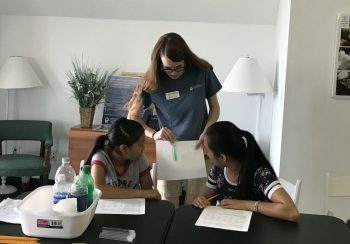 For more information on our summer interns and their projects, please visit nccoast.org/about-us/interns.